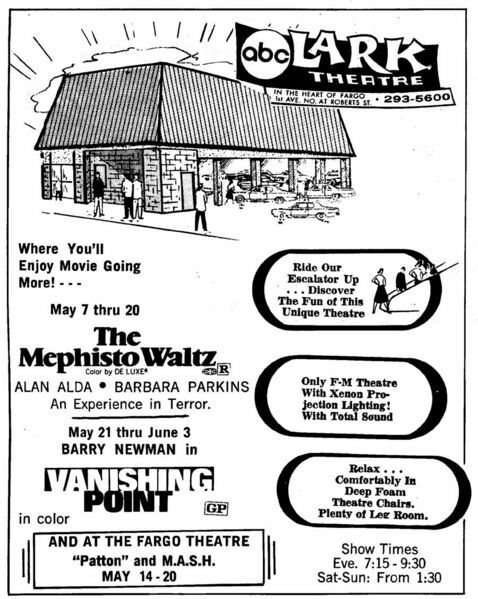 Lark movie theatre ad, 1970s. The Lark occupies the corner of Roberts Street and 1st Avenue in Fargo, one of the strange on-stilts buildings in Fargo designed to maximise parking space. The last time I was in the Lark was the Cinema Grill auction. 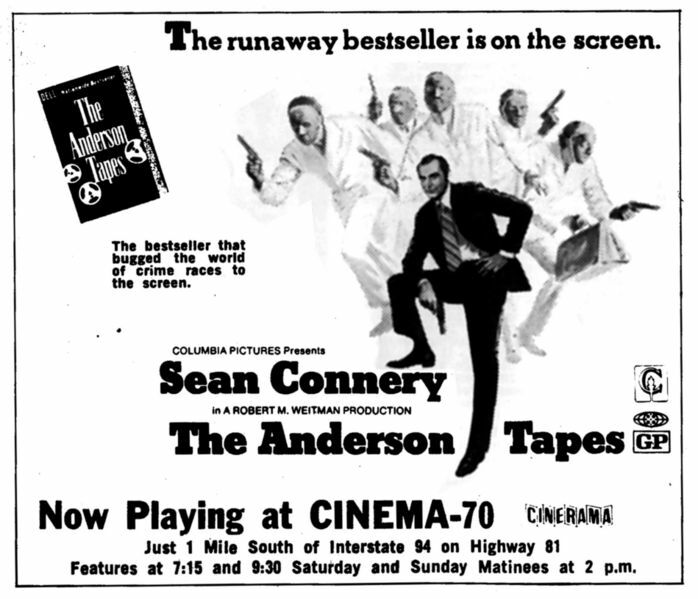 The building had been vacant through the 1980s, but in the 90s a company reopened it as a dinner-movie-theatre. I'd seen one movie there, but that was it -- the films appeared to be VHS projections, as opposed to actual film, and the lights were up enough so you could read menus, which made the screen harder to see. The food-film experiment ended in the late 90s, and a Christian church of odd repute (when I was at the auction, the church's leader spent some time telling me how 9/11 was predicted in Scripture) held services in it, and I believe is still occupying the building. There had been rumours of that block being razed to build a sports arena -- a very bad idea in my mind -- but that's my guess as to why the Lark is still there., waiting for a developer to come along. The ad was from a Binford Guide.